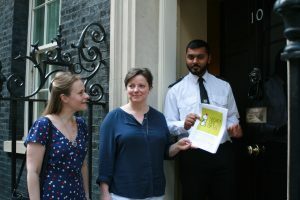 On 19 April, parents and members of the Disabled Children’s Partnership (DCP) have delivered a petition to Downing Street calling on the government to increase funding for vital short breaks services. The petition had received over 3,780 signatures. More and more short breaks services up and down the country are closing or being threatened with closure. Parents are having to take drastic measures such as fighting through the courts or organising protests locally to stop the closures. Many are parents of critically ill children, who shouldn’t have to do this. Stephen Kingdom, campaign manager of the DCP, said: “It should not take parents fighting in the courts to keep short breaks services going. Short breaks are essential to help families with disabled children continue to care for them at home. It’s unforgivable that these essential services are under threat across the country. Sam Bossi from Hampshire, mum to 16 year old Henry who had a traumatic brain injury as a baby, said: “Opportunities for short breaks are limited and services like ours are under continuous threat despite already being stretched and oversubscribed. Without them, we would not be able to cope. Short breaks mean that we can cope, just about. “We all know that budgets are under pressure, but it is frustrating to see individual budgets being cut with short term goals in mind, without a thought of the cost elsewhere in the system and society, both financially and emotionally. Nikki Lancaster from Hertfordshire, mum to Lennon who sadly died in August last year, said: “I have been part of a group of parents fighting the closure of Nascot Lawn respite care centre in Hertfordshire for almost a year. My son Lennon spent many happy times at Nascot Lawn, being cared for with incredible expertise.